For my wife Karen and me, the butterfly was an almost-buried year 2000 article by Long Beach, California freelance writer Pamela Mills-Senn. When we started investigating my father's career in 2002, we stumbled upon the article via the online library of the United States Lifesaving Association, "America's nonprofit association of beach lifeguards and open water rescuers." Little did we realize that her article -- about the bizarre campaign by my father and a lifeguard training company called Ellis & Associates to promote the Heimlich maneuver to respond to drowning victims -- would be the Rosetta Stone for our research and whistleblowing efforts that resulted in a hurricane of hundreds of tough print and broadcast media reports over the next decade. Stories that exposed my father as a remarkable -- and dangerous -- medical charlatan and con man. Stories that exposed his 30-year colleague, Dr. Edward A. Patrick, for having obtained seven state medical licenses based on a non-existent medical residency that my father helped fabricate. That "phantom credential" allowed Patrick to illegally practice medicine for decades in scores of hospital ERs. Stories that exposed the Save-A-Life Foundation, a now-defunct Chicago nonprofit reportedly under investigation for "the possible misappropriation of $9 million" in tax dollars. Stories that exposed the National Aquatic Safety Company's unethical, reckless protocol that trained lifeguards at major waterparks around the country to perform the Heimlich maneuver on drowning victims. Her article was the road map that steered us in all of these directions. Without it, I seriously doubt if Karen and I could have succeeded in our efforts to bring these major messes to public attention. And I think Prof. Lorenz would be impressed. Over the next four days, I'm proud to re-publish Drowning in Funworld. And fittingly, May is National Water Safety Month. If you value courageous journalism and want to learn how one butterfly started a hurricane, don't miss this. Before proceeding, I recommend that you read her article, Water Rescue Sequence: The Controversial Role of the Heimlich Maneuver. Despite those findings, in 1995, Jeff Ellis & Associates, the leading private lifeguard training company, took a radical step. Ellis, which trains lifeguards for Disney, Six Flags, Coney Island, and hundreds of other waterparks and public pools, began teaching their lifeguards to perform the Heimlich maneuver on drowning victims and to do so before initiating CPR. 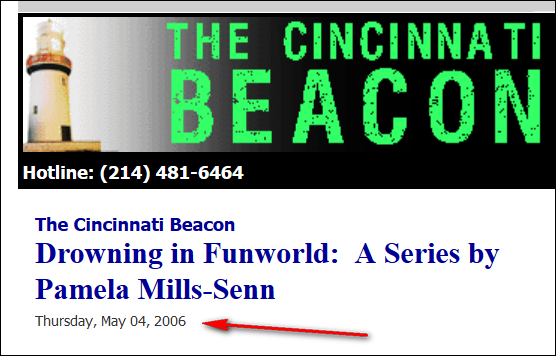 In year 2000, Ellis abruptly reversed course shortly after the appearance of an article by freelance writer Pamela Mills-Senn. The Beacon invited Ms. Mills-Senn to tell the story behind her landmark article. It started with a dream. Actually it was closer to a nightmare. I was running through a swamp, across a rickety wooden pathway barely above water level. And - I swear to God - I was knee-deep in alligators, snapping vicious alligators that were out to get me. As I was running, I kept trying to write, only the pad was really tiny and the pencil was like one of those they give you when you play miniature golf. And all I was thinking was, I can't write this. I woke up. It was two in the morning. I went into the next room, my office, and I looked at all the material spread out across the floor; research papers, interview notes, documents. I picked up one that was lying closest to where I was standing and then I saw it. I had looked at this particular research paper a million times over the last month. How could I have missed something this big? And then I knew. I would have to call my editor in the morning and tell him that I couldn't write the article. Not yet. Go back about six weeks or so. My editor at Funworld magazine, the trade pub for the amusement and waterpark industry, had asked me to write an article on the use of the Heimlich maneuver, rather than CPR, as a first response to resuscitating a drowning or near-drowning victim. In 1995, Ellis & Associates, an aquatic safety and training consulting company based in Houston, had adopted this protocol; a huge coup for Dr. Henry J. Heimlich who had met with virtually total and unanimous resistance from the medical and scientific community to using his maneuver for this purpose. Ellis & Associates were at the time, and still are, industry leaders. They provide lifeguard training to probably most of the waterparks across the country and to the major amusement attractions that have water features. They were, and may still be, very important to the International Association of Amusement Parks and Attractions (IAAPA) the powerful trade association for this industry and also the publisher of Funworld. By that time, around 1999, I had been freelancing for six years. I picked Funworld up as a client about a year or so earlier and had become a fairly regular contributor. I especially liked the editor. He was experienced, had a good sense of humor, was unflappable and fair, and was keen on providing balanced and unbiased content not always easy to do when it comes to trade pubs. Editors for these magazines typically labor under a lot of top-down and sales-generated constraints, the primary one being not to run articles that are going to piss off key industry members and advertisers. So when the editor made this assignment, to look at the innovative way Ellis & Associates were handling drowning resuscitation, we both figured this would be the typical sort of feel good article along the lines of, "Hey, this is what they're doing and why -- and isn't this cool?" We had no idea what we had gotten ourselves into. Most articles have a turnaround time of about a month or so. You find your sources, make your calls, interview (typically for the Funworld word count, which ran about 2,500 words, this meant no more than five-to-eight interviews) and then allow a couple of days to write the thing up, more if you want to build in procrastination time. By the night of that dream, I had run out of time and had to start writing the article the next morning. The only problem was that as I went to organize my materials, I had a very uneasy sense that something was wrong. My first interview had been Dr. Heimlich, whom I found unexpectedly approachable. He laid out his argument for the maneuver so logically and compellingly that I couldnt see why there was an argument against its use for drowning resuscitation at all. My next call was to Mary Fran Hazinski RN. She was with the American Heart Association and had at the time, over 25 years of experience as a pediatric critical care nurse. She was also the immediate past chair of the Emergency Cardiovascular Care Committee of the AHA. The AHA unequivocally does not endorse the maneuver for drowning. It never has and undoubtedly never will. And they have said this over and over again, and explained the reasons to laypeople, the media in particular, countless numbers of times, often to no avail. Hazinski was tired of talking with journalists whom she described as more interested in running sound bites that doing actual research. She was singularly unimpressed by me, especially since I came off as being a little too pro-Heimlich for her taste on the voice mail message I left her. She was even less receptive days later when she and I actually connected. She was right; I was not entirely objective by the time I reached her. By then, I had spoken with Jeff Ellis, president of Ellis & Associates, about their exciting and life-saving protocol and between him and Heimlich, I had starting feeling pretty positively about what they were doing. In spite of trying to maintain some semblance of journalistic neutrality, Hazinski picked up on my bias. Still, she agreed to mail me documents and research papers on the mechanisms of drowning and on drowning resuscitation conducted by acknowledged drowning experts. Heimlich and Ellis agreed to do the same. When the materials starting arriving I saw that both sides had sent me the exact same research (Although Heimlich also sent along several of his own studies, correspondence, and his chapter, "Scientific Facts Show Heimlich Maneuver Best Method For Drowning." Additionally, Heimlich sent only partial copies of the research studies highlighting certain sections or sentences whereas Hazinski had sent complete copies minus any highlighting). How could two such diametrically opposed camps be working from the same stuff? For a detailed bio and contact info, click here. In Spring 2002, my wife Karen and I began researching the career of my father, Henry J. Heimlich MD, famous for "the Heimlich maneuver." To our astonishment, we uncovered a remarkable unseen history of fraud which exposed dad as a remarkable and dangerous medical charlatan and con man. Since Spring 2003, our research into my dad's career and other subjects has been the basis for hundreds of mainstream print and broadcast media reports. Newsworthy tips are always welcome. E-mails marked "confidential" will be treated with the utmost discretion. Broken links, missing videos, or other errors? Please drop me a line..